The circuit-switched telephone system has its own power and is available even during an electrical power outage because of independent backup power sources at the Central Office (CO) where the telephone switch is located. DSL is offered over copper wiring as used for the telephone and is served via the CO. Where there is a telephone, there can be DSL service. There is better security because of the point-to-point nature of the copper twisted-pair that runs into the subscriber premise, in contrast to shared physical mediums used in cable modem technology. In recent times (Oct 2011), with the highly competitive availability of other technologies such as cable modems and fiber optics links, I began to open my mind to the alternative technologies. The two ISPs in my area are Bell Aliant and Eastlink where the former offers DSL and fiber optics while the latter offers cable modem technology. The cable modem infrastructure consists of a 'node' managing the neighborhood segment where Eastlink network engineering targets 20 to 100 cable modem subscribers based on various factors. The 'node' is connected to a Cable Modem Termination System (CMTS) which handles traffic to/from the Eastlink routing network. I have come to learn that there are individual hardware communications channels on the shared neighborhood segment which only allows each connected cable modem to access its authorized channel. Although traffic on the shared segment is not encrypted, I have been told that there is very little likelihood for cable modems to tap other subscribers' traffic on the shared physical medium. In a recent power outage lasting 7 hours due to wind storms causing power lines to break, it occurred to me that the survival of the DSL service during electrical power outages is of little use since I do not have electrical power for the DSL modem and my computer. With Bell Aliant's TV advertising campaign promoting FibreOP, I could not resist calling to inquire but was quickly disappointed that it is not available in my area, with no commitment by Bell Aliant on when it will come to my area. I was subscribed to the Bell Aliant DSL service at up to 7 Mbps download with 640 Kbps upload speed of which I was getting 3.5 Mbps and 500 Kbps (due to my distance to the CO and the quality of my copper wiring). When I was in the promotional period paying around $45/month for that service, it was a decent deal. When Bell Aliant applied their non-promotional and non-contractual rate of $65/month, it was time to consider voting with my wallet. Eastlink provides 'Internet 20' which offers 20 Mbps download and 1 Mbps upload speed for $63/month. With it bundled in with Eastlink phone service, it comes to around $60/month for the Internet service. On initial installation and setup, I was getting the 1 Mbps upload speed but was disappointed to witness 12 Mbps download speed. Over several calls to Eastlink technical support where they asked me to perform a number of checks including starting my computer up in 'safe mode with networking' and removing my home router from the traffic path, I was able to convince Eastlink that it is not an issue with my equipment or cabling since the Eastlink installer used a brand-new coax cable to connect the cable modem to the demarcation point on the wall of my house. I suggested to Eastlink that the problem must be somewhere beyond the demarcation point. Eastlink concluded that they will send a service rep. Different Eastlink call-center agents may give you a different answer on how much a subscriber is expected to get from the specified 20 Mbps service. Iintially, they said Eastlink engineers for about 90% of the 20 Mbps under normal operating situations. As I was reporting my 12 Mbps issue, I heard 80% and then 70% being stated by Eastlink agents. After a week of waiting for an Eastlink service visit, I decided to inquire, but first I re-tested my download and upload speeds. 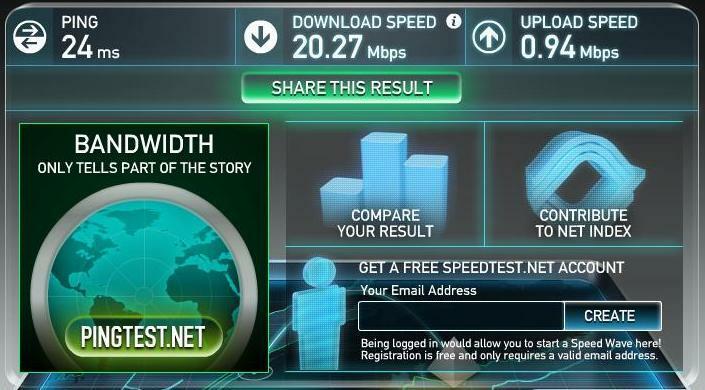 To my pleasant surprise, I am now getting 20 Mbps download along with the 1 Mbps upload. At this point, I cannot complain at all and will continue to periodically test the speeds to ensure it remains at a high level of performance. My speed testing includes the usage of two sites speedtest.eastlink.ca and speedtest.net. The former may be restricted to Eastlink subscribers only but the latter is available to everyone. Click each image to enlarge. 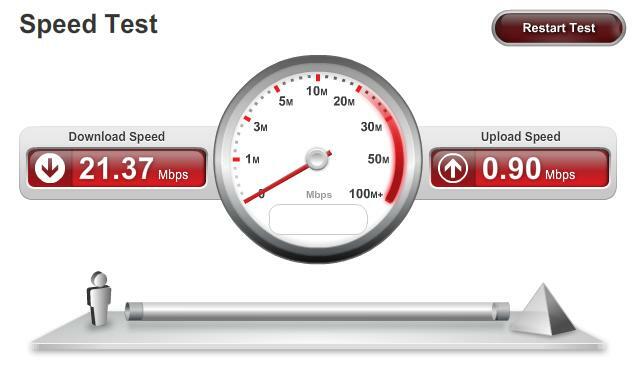 May/2013: I switched to Bell Aliant's FibreOP Internet as explained in Internet Service Providers - Speed Test (2013). At the time of switchover, I am getting around 10Mbps download on a good day with speed more around 7Mbps due to traffic volume on the shared neighborhood node.